Two kittens find the night sky beautiful. Help them collect all stars that fell down. Click on the right position and command a kitten to get the star! Do you like watching the night sky? It's so exciting, especially when you see a falling star! But have you ever seen one from the close distance? Of course you haven't! 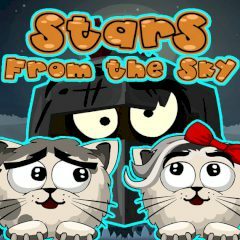 Get on this wonderful adventure and collect as many stars as you can. Move a kitten by clicking on the position you want it to be and dodge all obstacles!